Are you looking for an easy way to make mac and cheese without dairy? 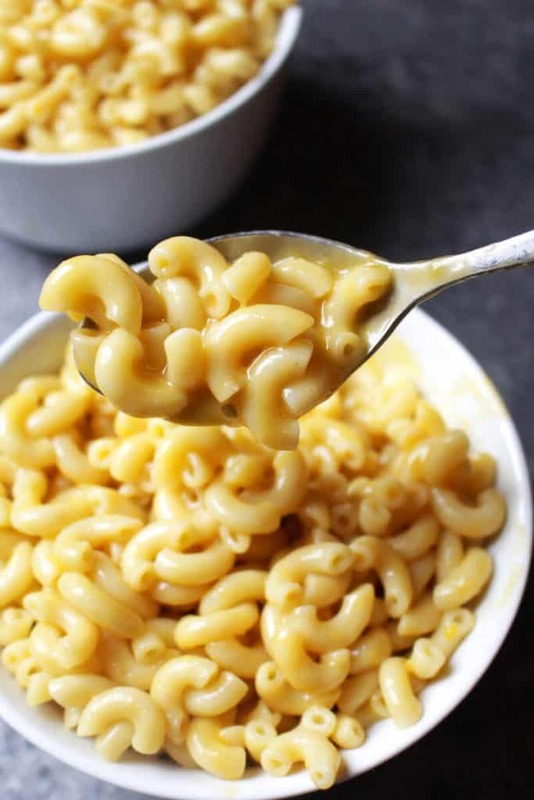 Then this guide to vegan mac and cheese is just perfect for you! It answers the most frequently asked questions on how to make vegan mac and cheese. Besides, it includes 7 unique ways to make this ultimate vegan comfort food! From cashews over butternut squash to cauliflower! It is incredible how many different ingredients you can use to make vegan mac and cheese. In this post I will talk about the most common ways to make a vegan version of this popular pasta dish and provide you with some amazing recipes! Get ready for vegan deliciousness! 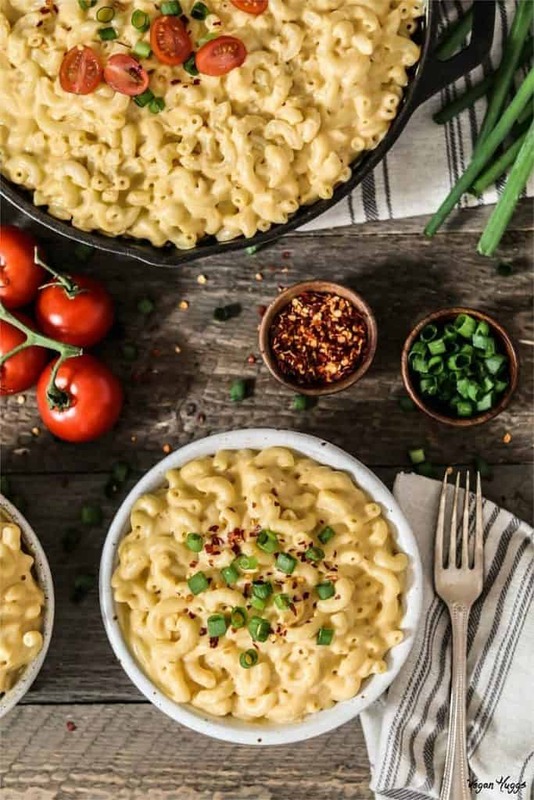 In this guide to vegan mac and cheese you will find seven sections that talk about different ways of how to make vegan cheese. Click on the link beneath each photo to see the full recipe. Always make sure to use unsweetened plant-based milk. The recipes won’t work with sweetened or flavored milk. Invest in a good blender to be able to make super creamy and velvety cheese sauces. Soak the cashews over night in hot water to make it easier for your blender. This is not necessary if you use a Vitamix or another good high speed blender. Make a larger batch of vegan cheese sauce and freeze it for later. In most cases this works out really well. Add peas, mushrooms, and spinach to your mac and cheese. The most popular version of making dairy-free mac and cheese is by using cashews as a base. It results in such a creamy and velvety vegan cheese sauce! This vegan mac and cheese is one of my all-time favorites! A combination of cashews, cooked potatoes, and carrots makes it incredibly creamy. It’s packed with flavor and it’s completely oil-free. Spice it up with some paprika powder and freshly chopped parsley. I also love to add in peas and mushrooms, but feel free to add any veggies you like. Spinach would also be a great idea. It’s my basic vegan mac and cheese recipe that is also great with other kind of pasta or gnocchi. 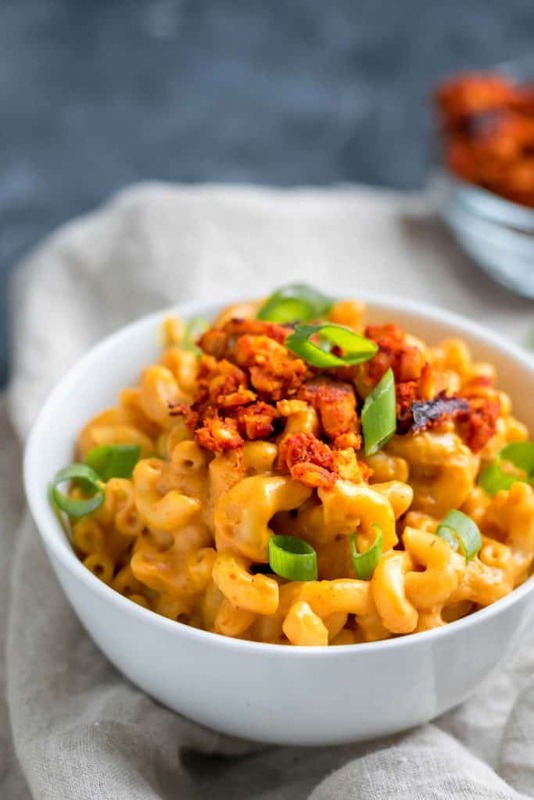 If you’re looking for a spicier version of mac and cheese, you might like this spicy chipotle mac and cheese by Eva from The Curious Chickpea. The sauce is also made with cashews and nutritional yeast, but for an extra kick of flavor Eva added chipotles in adobo. She topped it off with spicy chipotle marinated tempeh crumbles and scallion greens. Vegan comfort food at its best so to say! 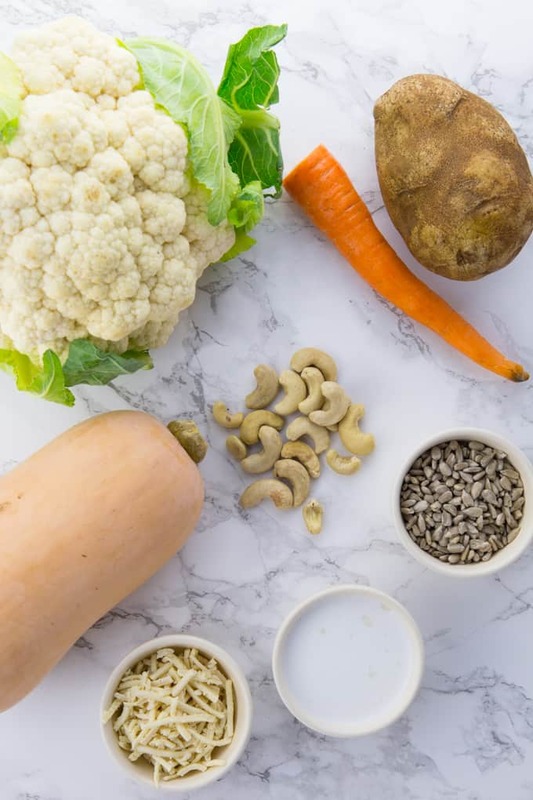 Mary Ellen from V Nutrition also has a delicious looking basic recipe for vegan mac and cheese with cashews on her blog. She adds coconut milk to the sauce to make it even creamier and velvety. You can also use this sauce on baked potatoes, broccoli, and nachos. Can you believe you can make vegan mac and cheese out of vegetables? I mean vegetables?! This totally is a thing and it turns out incredibly delicious! And it’s such a great way to include more vegetables in your diet. You just cook the vegetables and then blend them into creamy sauces together with spices and sometimes nuts. 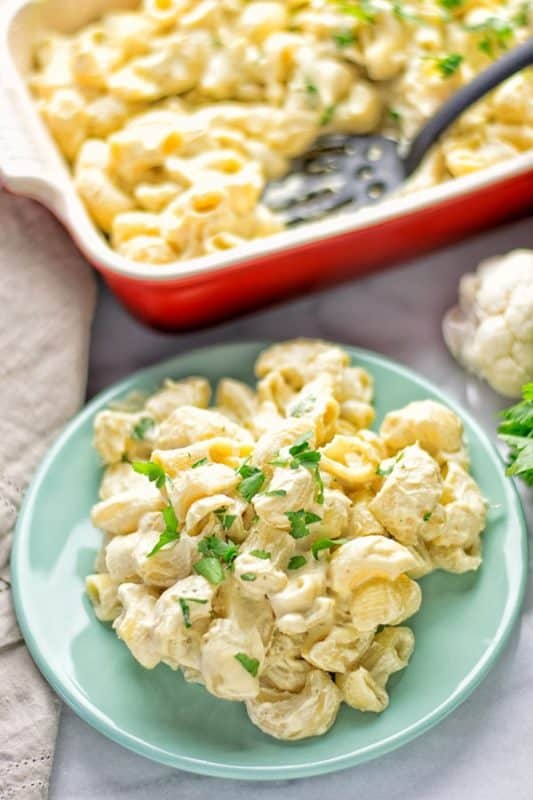 This sharp white mac and cheese casserole by Sophia from Veggies Don’t Bite is the perfect example for vegan mac and cheese with vegetables! Sophia used starchy potatoes, carrots, and yellow pepper for this incredibly healthy sauce. What a great and sneaky way to get even the most picky eaters to eat their veggies! For the crispy topping she used hemp seeds and toasted bread. 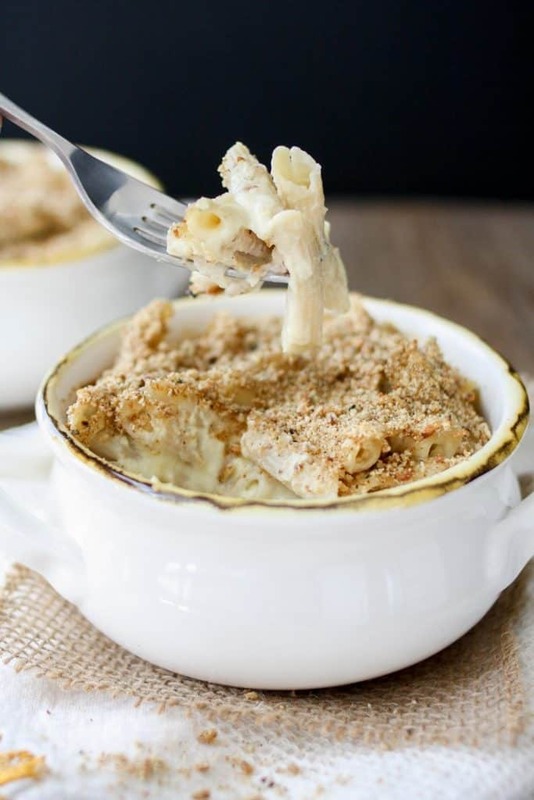 Melanie from A Virtual Vegan also has an amazing recipe for baked vegan mac and cheese on her blog. She uses yellow sweet potato for the base as well as cauliflower. One of the key ingredients of her recipe is tapioca flour. It gives the vegan cheese sauce a very similar texture to real cheese. It’s even stretchy! 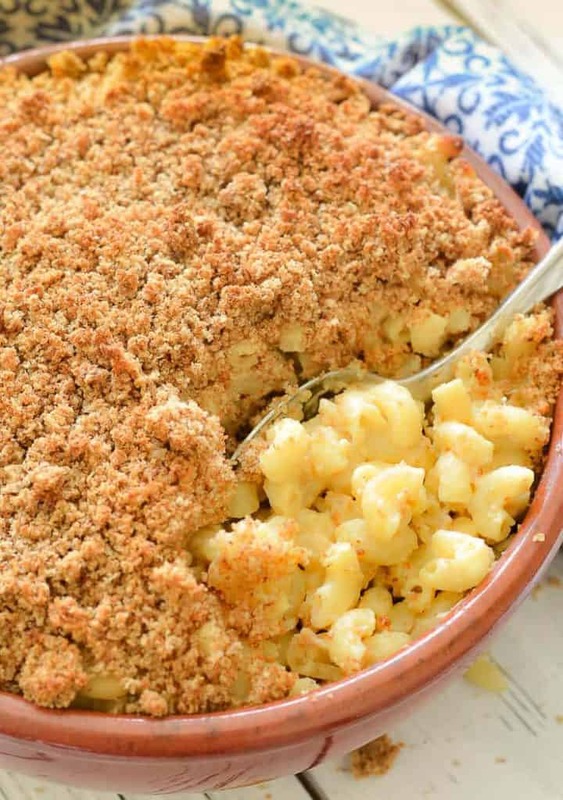 Melanie’s baked mac and cheese with golden crispy crumb topping can even be made ahead if you want. 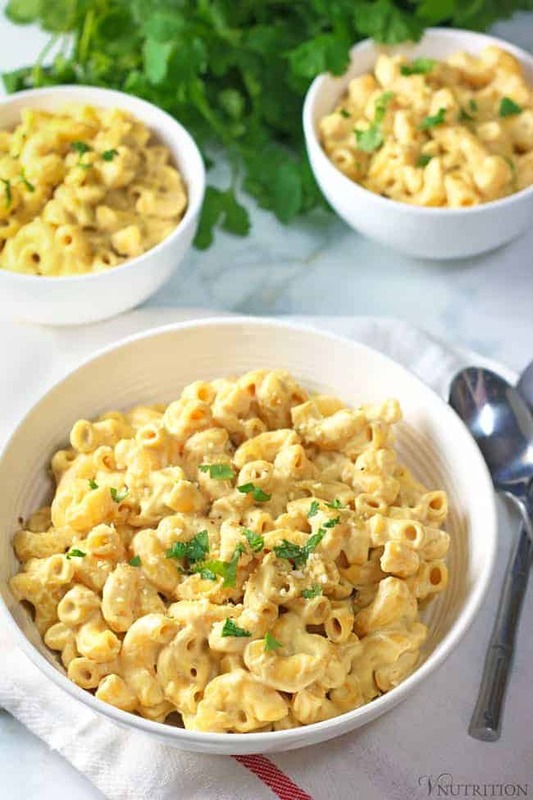 Another dairy-free mac and cheese recipe I can recommend is by Melissa from Vegan Huggs. Her mac and cheese with potato, carrots, and cashews does extremely well on Pinterest. I mean just look at it! BIG yum!! Melissa also used tapioca starch in her recipe because it gives the sauce extra thickness and a “cheesy” stretch. All in all, the recipe takes less than 30 minutes, which makes it a great weeknight dinner. Cauliflower is such a healthy and versatile vegetable. It’s perfect for creamy sauces! This is the most cheese-like vegan mac and cheese I’ve ever made! It uses a combination of cauliflower, cashews, and tapioca starch. It doesn’t use a lot of cashews, so it’s still relatively low in calories. And the best thing is that the sauce almost stretches like real cheese!! Doesn’t this cauliflower mac and cheese by Florian from Contentedness Cooking look extremely rich and creamy?! It’s a great example of using cauliflower as a base for vegan cheese sauce. Florian paired it with cashews, tahini sesame paste, and mustard sauce for more flavor and creaminess. Another vegetable that is perfect for vegan mac and cheese is butternut squash. 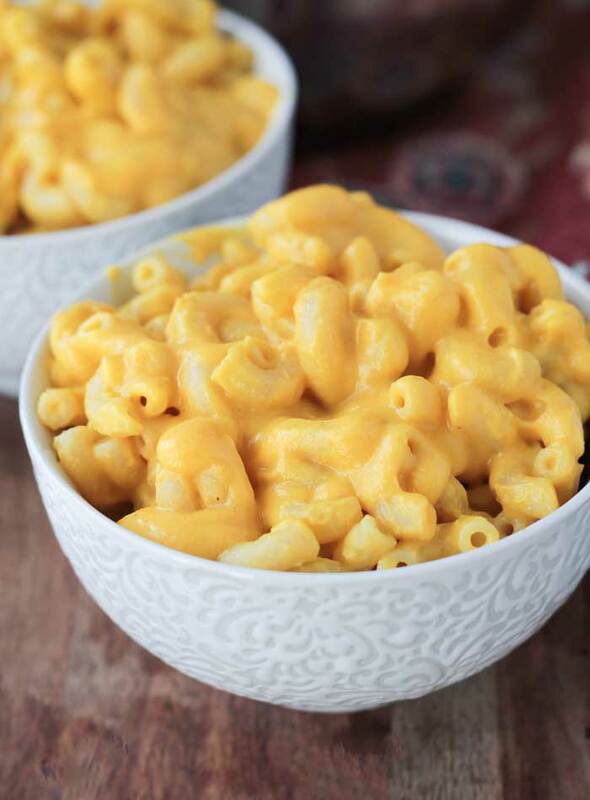 Jenn from Veggie Inspired did an amazing job in creating this vegan butternut mac and cheese! It was even featured on a TV show and is extremely popular on Pinterest. For the sauce, Jenn used a combination of cooked butternut, cashews, mustard, lemon juice, and spices. The outcome is an incredibly healthy and creamy sauce that is soy-free as well as dairy-free. 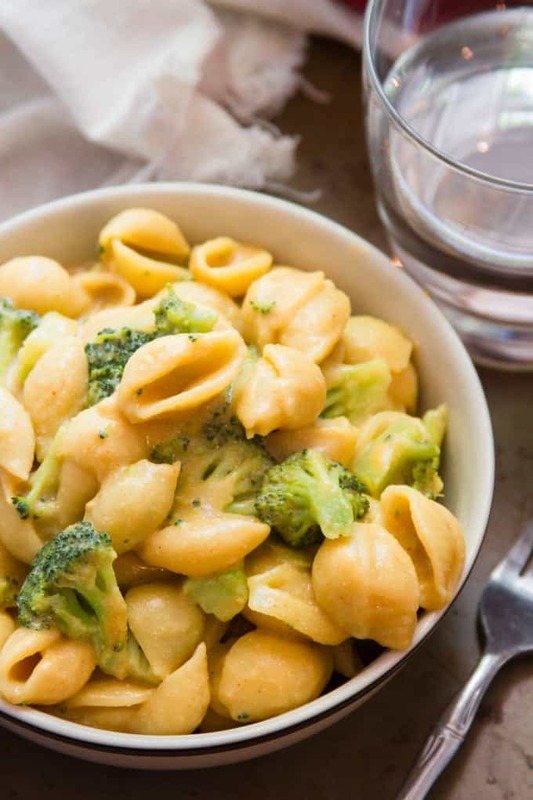 Alissa from Connoisseurus Veg used coconut milk as a magic ingredient for her creamy mac and cheese with broccoli. This recipe is incredibly easy and it doesn’t even require blending like most other vegan cheese sauces. And one of the biggest pros of this recipe is that it’s super allergy-friendly! Unlike most other vegan mac and cheese recipes it’s completely nut-free and can also easily be made soy-free. The perfect weeknight meal for families with allergies! Of course you could also use store-bought vegan cheese and butter for your homemade vegan cheese. Vegan mac and cheese with daiya cheese is for example pretty popular. 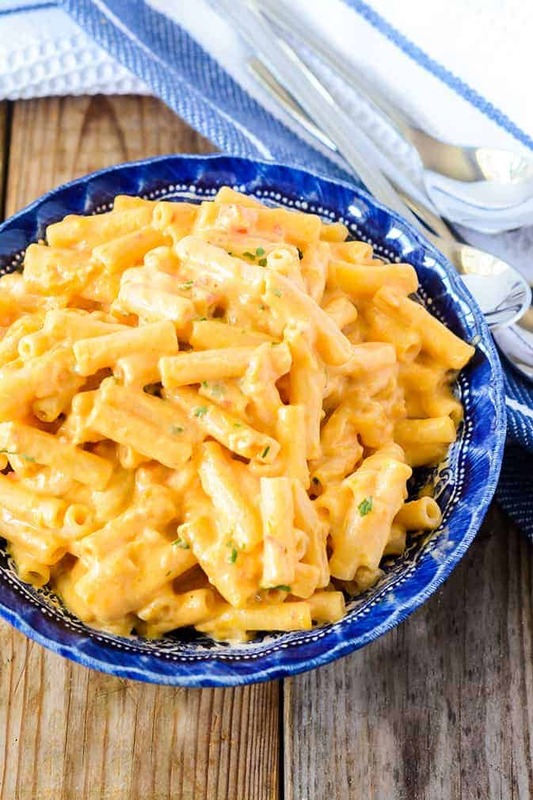 This Instant Pot mac and cheese by Karissa from Karrisa’s Vegan Kitchen calls for shredded vegan cheese and non-dairy milk. The recipe couldn’t be much easier! You make everything in the instant pot, including cooking the pasta. First you cook the pasta and then you add the ingredients for the vegan cheese sauce. The total cooking time is 8 minutes. 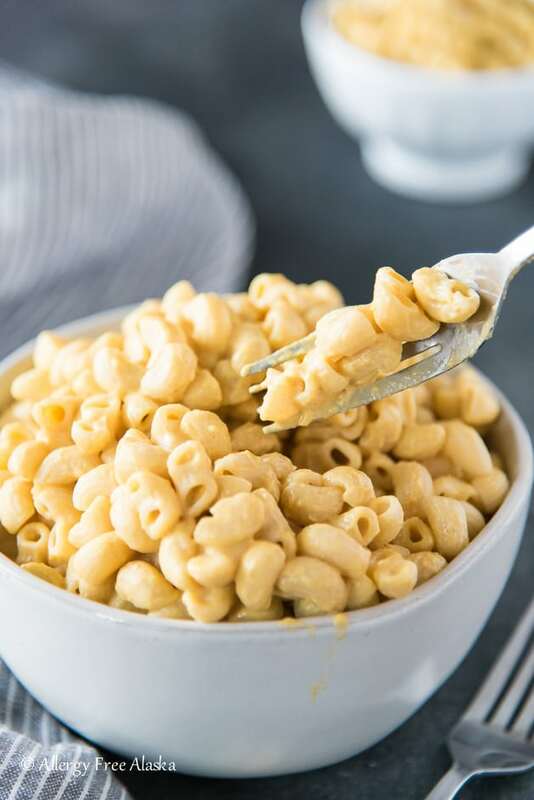 Michelle from Healthier Steps uses a combination of cashews, coconut milk, store-bought vegan cheese, mayonnaise, and vegan butter for this incredibly creamy vegan mac and cheese. This sauce is not only cheesy and velvety but also buttery. And all without using any kind of dairy products! 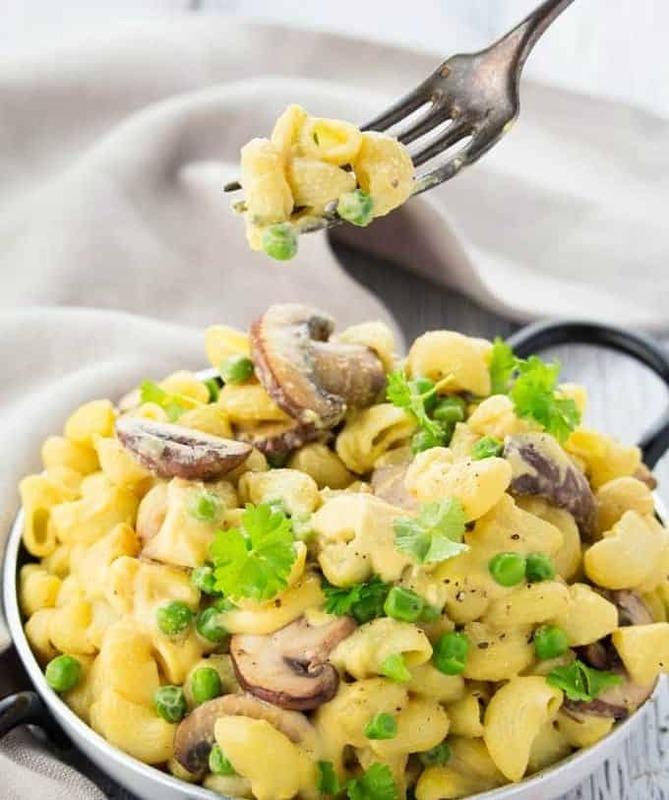 Especially for people with allergies it can be hard to find a satisfying vegan mac and cheese recipe as a lot of recipes call for cashews. 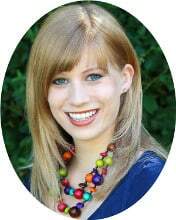 Megan from Allergy Free Alaska got the perfect solution for you! She uses a combination of raw almonds, nutritional yeast, and butternut squash for her dairy-free mac and cheese. If you’re allergic to almonds you could also use sunflower seeds instead. You could even freeze this vegan cheese sauce in covered ice cube trays if you want. Perfect for busy weeknights! Another allergy-friendly way would be to use white beans as a base. If done this for the vegan cheese sauce I used for my vegan chili cheese fries. Just leave out the cashews. The recipe will still turn out delicious! Also check out Alissa’s recipe under the category 5 “vegan mac and cheese with coconut milk”. Her recipe is nut-free as well and can easily be made soy-free. 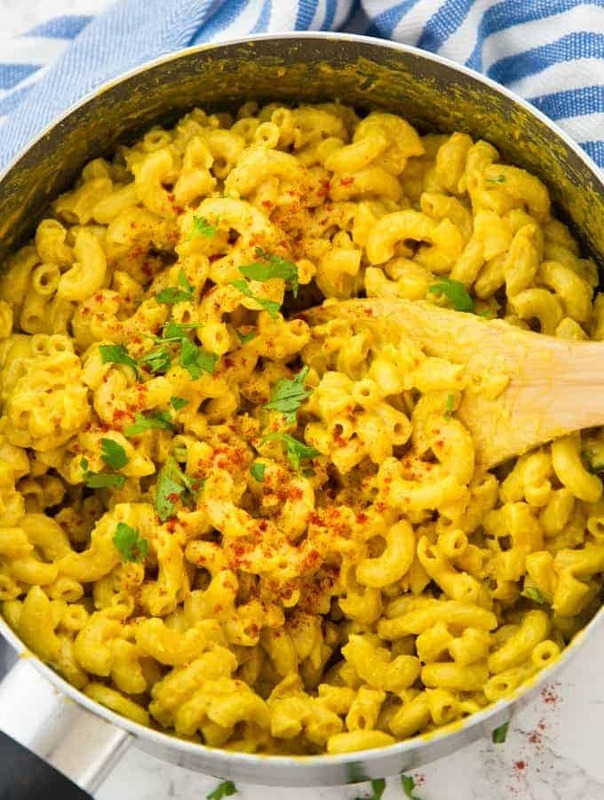 Nutritional yeast plays a big role in making vegan mac and cheese. It’s a deactivated yeast that you can buy as flakes or as powder. It can usually be found in the bulk aisle or in the natural food section of many supermarkets. Nutritional yeast has a strong cheesy and nutty flavor, which makes it the key ingredient in many cheese substitutes. Can I freeze vegan cheese sauce? Yes, most vegan cheese sauces can easily be frozen. Either freeze them in freezer-safe containers or in ice cube trays for smaller portions. Defrost slowly when ready to eat. Can I make a vegan cheese sauce without nuts? While cashews are a key ingredient in many vegan cheese sauces, you can also make vegan mac and cheese without nuts. Butternut squash mac and cheese can, for instance, easily be made without cashews. You could also use sunflower seeds instead of nuts. Another option would be to use white beans as a base for your nut-free vegan cheese sauce. I included some more allergy-friendly recipes for you at the end of this post. So just keep scrolling. I hope you like this little guide on how to make vegan mac and cheese. 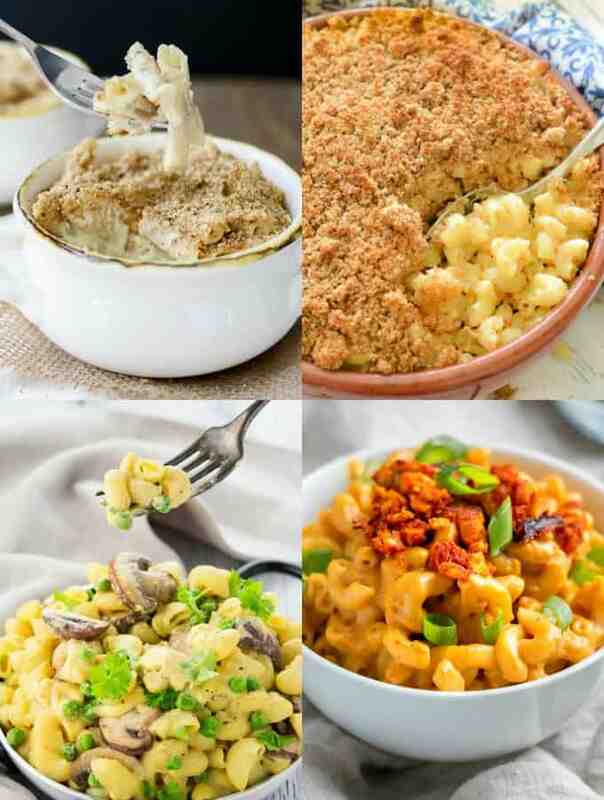 There are so many different ways to make mac and cheese without dairy! 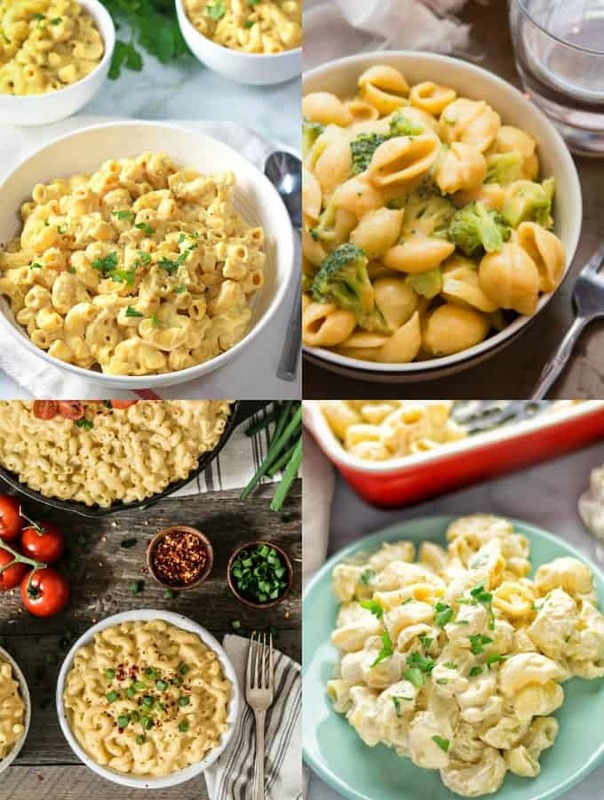 What do you think is the best vegan mac and cheese recipe? 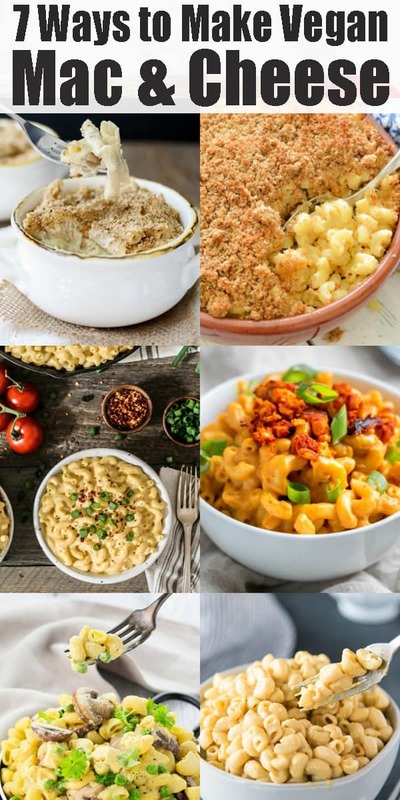 A post dedicated solely to ALL the vegan mac and cheese? This is a post I can get on board with! I can’t wait to work my way down this list and try them all! Thanks for including my Butternut Mac! I made the vegan cheese sauce from Megan, Allergy Free Alaska using sunflower seeds which I’d soaked overnight and cauliflower, fresh garlic plus some oats in place of butternut squash. Good sauce which I used for broccoli and spinach.